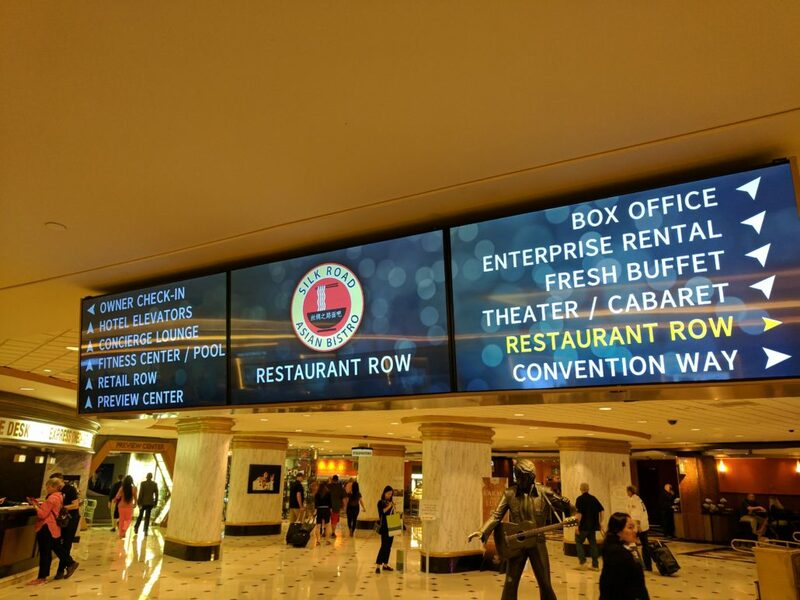 DCBolt Productions was selected as the preferred provider to design, install, commission, manage and create custom content for digital signage at Westgate Las Vegas Resort & Casino. Over 150 digital signage displays were required, including custom LED screens, 4K video walls, HD displays, and projections which were individually controlled and managed by various teams. With Signagelive as the backbone, DCBolt presented a turnkey solution for the digital signage system, and delivered a wide range of content including wayfinding, restaurant menus, interactive social media display walls and custom eye candy that allows guests to connect with the Westgate brand. The resort has been working with Orlando, FL-based solutions provider DCBolt Productions on a revamp of the set-up and content.The network includes promo and wayfinding displays in a variety of configurations, custom LED walls and a pair 2×5 video walls located in the elevator waiting lobbies. Westgate Resorts is the largest privately owned timeshare resort company in the world and has over 30 properties spanning across North America. As one of its largest properties, Westgate Las Vegas Resort and Casino serves as a hub for conference-attendees and nightlife seekers, thanks to its convenient location adjacent to the Las Vegas Convention Centre and just one block from the Las Vegas Strip. WGLV features a unique blend of excitement with incredible restaurants, amenities, entertainment and a lively casino that is home to the world’s largest Race & Sports Book, featuring the largest indoor LED screen in the world. The Westgate Las Vegas marketing team wanted to reduce its dependency on printed material and needed a reliable means of communicating key and timely information digitally to guests and staff. Westgate needed a way to drive guests to restaurants, the convention centre and streamline their campaigns and on-premise promotions for ticketed entertainment and other amenities. The rollout is an on-going process as Westgate Las Vegas continues to add new displays throughout the Las Vegas resort. DCBolt continues to support Westgate on a strategic and content development level, expanding the digital signage network and providing creativity through digital art that drives the Westgate brand. “We’ve worked with a wide range of digital signage platforms in the past, and Signagelive is now our preferred CMS thanks to its versatility, intuitive interface and robust features. It was the obvious choice for Westgate because of its usability and scalability – from single menu screens to property-wide signage – it covers all the bases.